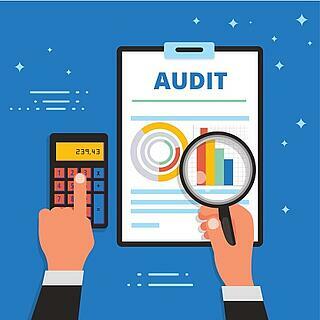 Audits can be anxiety producing but they don’t need to be. You just need to be organized. Expect a Risk Assessment, performed by the auditors to determine what they want to review. They provide a list of what they want to see in advance of the visit. Auditors to be in your office for a day. Enter necessary Journal Entries for insurance, payroll, depreciation, and other year-end adjustments. Bank/credit card accounts agree with bank reconciliations (check all uncleared transactions). Check all bills received after year-end. If bill relates to prior year, record a Journal Entry to include the expense in the prior year (only if on an accrual basis). Complete the Quick Audit Checklist to make sure you didn’t miss anything during your close. Make the necessary corrections and your QuickBooks will be clean. Ask for closing entries from the prior audit and enter them. Look over your filing system so you are confident that everything is easy to find. Each file should be complete. For example, if a check to pay a vendor is voided, document the replacement check information. Make sure supporting systems agree with your financial software. For example, separate invoicing or merchant service system must agree with QuickBooks. Consider holding 8-16 hours on your calendar in the two weeks preceding the audit to compile information. Expect a lengthy Audit Request List from your auditor one to two weeks in advance of the field work that include bank confirmation letters you send to your banks. Determine with the Auditor the date when no more changes can me made for the year being audited. Start compiling information for the Auditors. Clearly note on each document you provide the number from the Audit Request List. Keep a list of everything that you hand them, they may ask for the same document twice. Provide only electronic or copies when possible. Information may not be returned. Don’t file Audit Request List documents away until the audit is completely done and financial statements are issued. Auditors may want to see an item again. Make sure you keep check stubs or get bank statements that include copies of the check. Still worried about your audit? Call us, we would be happy to take this worry off your hands by completing some or all of the above steps.